This was the fourth time Angels had appeared in Jesus’ midst. 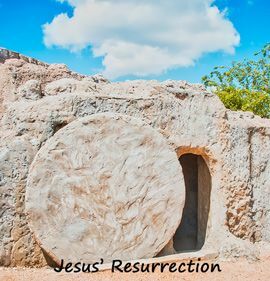 They appeared at his birth, his temptation in the desert, his agony in the Garden of Gethsemane and now at his resurrection. When the soldiers recovered their senses and seeing Jesus’ tomb empty, they hurried to tell the Jewish leaders whom they were temporarily accountable to. The leaders arranged a council assembly, a meeting of probably the majority of the Sanhedrin. “How did they steal him? O most foolish of all men [Apostles]… and [after his arrest] not venturing so much as to show themselves? And [why would] they steal it? That they might feign the doctrine of the resurrection? And how could they remove the stone that was made sure? How could they have escaped the observation of so many? Risen Lord Jesus, as we celebrate your resurrection, help us to imitate your life through living your Gospel in a missionary spirit. Watch, Lord, with those who wake or weep today/tonight. Give the Angels and Saints charge over them. Let’s celebrate the good work of men throughout the world and pray that all will come to respect the wonders of God’s creation.